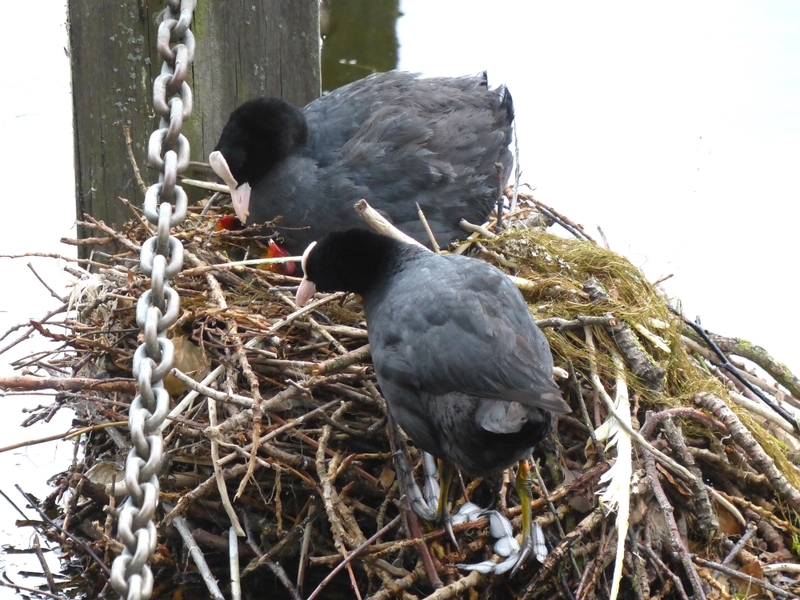 The Coots' nest near Peter Pan now has two chicks in it. Although it is very close to the shore, it is quite hard to see what is going on, as the mother bird is extremely protective and keeps the young ones firmly under control in case a gull should be passing. A Grey Heron also has the idea of a Coot lunch, but if it approaches the nest too closely it is furiously attacked by the male Coot. 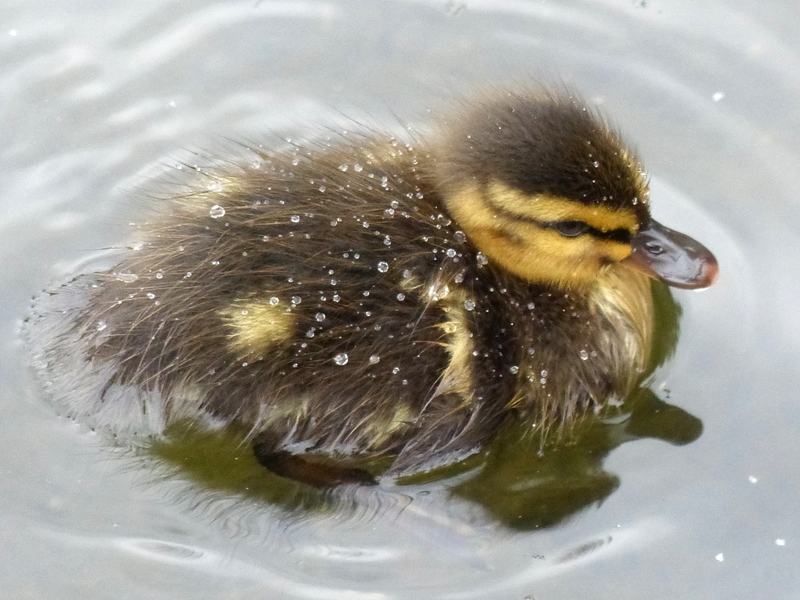 Eight of the Mallard ducklings are still alive, though they passed dangerously close to the same heron as they followed their mother along the edge of the lake. This picture shows the splendidly water-repellent nature of their downy feathers. 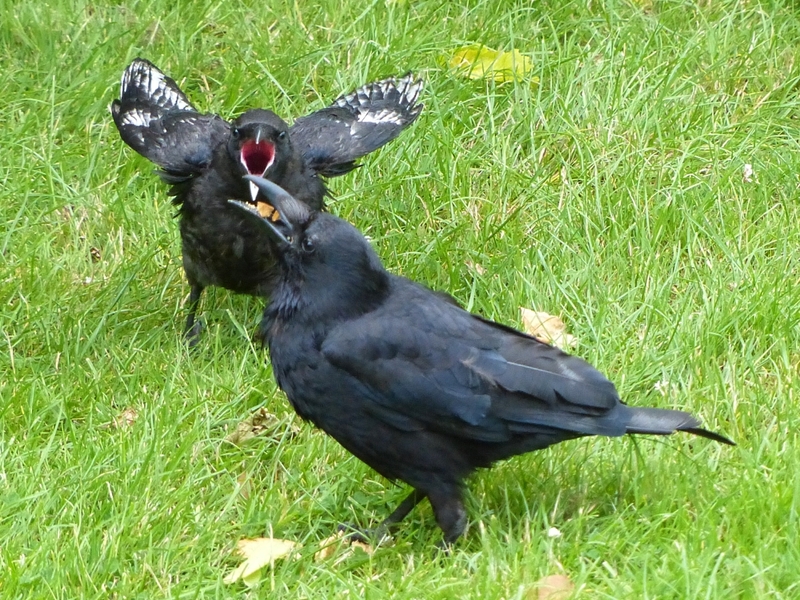 A pair of Carrion Crows, also near Peter Pan, have a single fledgeling with some white-flecked bands in its wings. These may be the result of periods of poor nutrition during which the black pigment was not laid down in the growing feathers. 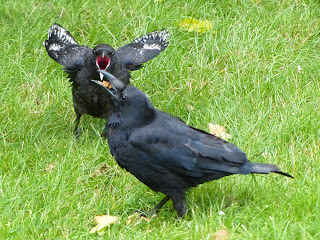 But Kensington Gardens is a rich feeding ground for crows, and they can feast on discarded food here and around the restaurants of Queensway, and on snacks given to them by park people like me, who find crows endlessly amusing and like to have them around. Here the young bird begs noisily for food, flapping its wings in a display typical of songbirds. And yes, a crow is a songbird; corvids are the largest of the Passeriformes (literally 'sparrow-shaped'). If you record their raucous cries and play them back at high speed, they sound like the tweets of of any little bird. The Little Owl was in his usual place, but there was no sign of the Tawny Owls. The six young Egyptian Geese on the Round Pond are still in good order. I didn't see a single gull when I went past, and there were only a couple of Lesser Black-Backed Gulls over the Long Water. For reasons known only to themselves, they are keeping to the Serpentine. 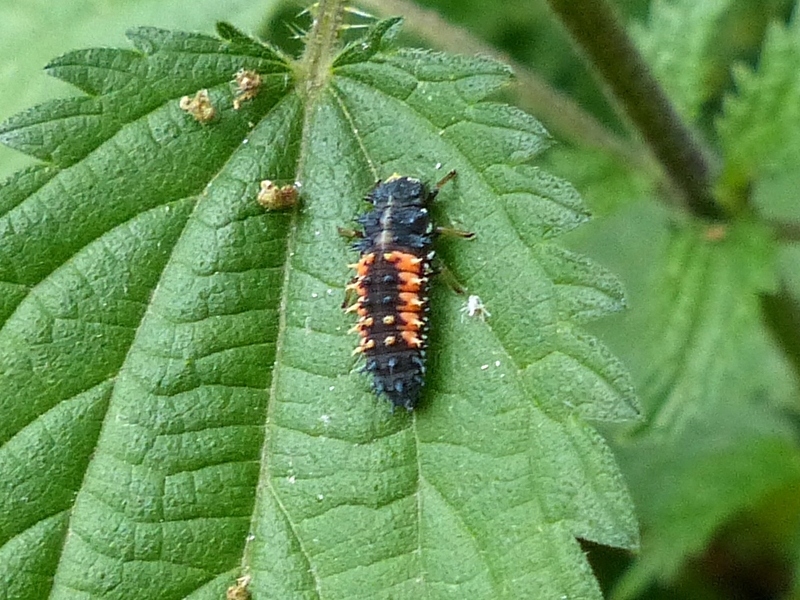 This is a larva of the invasive Harlequin Ladybird, Harmonia axyridis, which I saw in the leaf yard. It is a pretty creature, but bad news for our familiar native red ladybirds, which it outcompetes and sometimes even eats.